As a resident of Missouri, Amy drew many parallels between Branson and the Pigeon Forge, TN area. She noted that the two family vacation hubs shared many attractions, including Dixie Stampede, the Titanic Museum, Ripley’s Believe It or Not! Odditorium, zipline courses, mini golf, and go-kart tracks. What truly sets the Pigeon Forge region apart from Branson, writes Amy, is East Tennessee’s breathtaking natural beauty. Originally, Amy and her family had intended to do a lot of hiking in the Great Smoky Mountains National Park during their visit. However, the 95 degree weather made them rethink their plans. Fortunately, the heat didn’t stop the Bertrands from going whitewater rafting! 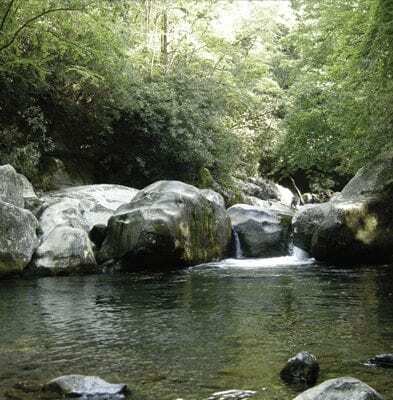 In fact, the Pigeon River is the perfect place to spend a sweltering day in the Smokies. Rafting always results in plenty of splashing, which feels nice and refreshing during the dog days of summer. Amy went rafting with her husband, her father, and her two sons (ages 11 and 9). Here at Smoky Mountain Outdoors, we specialize in family trips. No prior experience is necessary to go rafting with us. In fact, you don’t even need to know how to swim, because every guest receives a Coast Guard approved lifejacket. In order to raft the Upper Pigeon River, as the Bertrands did, children must be at least 8 years old or 70 pounds. For the Lower Pigeon River, kids must be at least 3 years old. In her article, Amy admits that she was nervous heading into the rafting trip, especially for her “daredevil 9-year-old”. Our guides are very used to having anxious guests, and they will do everything in their power to put your mind at ease. Amy’s guide, “Miami John”, sensed that she was a bit antsy and offered to keep her youngest son by his side in the raft. All of our guides are certified in Standard First Aid and have lots of experience rafting on the Pigeon River. Are you ready to take your own whitewater rafting expedition in East Tennessee? Smoky Mountain Outdoors offers a variety of trips down the Pigeon River that your family is sure to love. Whether you choose our Lower Pigeon River trip, Upper Pigeon River trip, Upper Pigeon River Extreme trip, Inflatable Kayak trip, or one of our other adventures, you are guaranteed to have an unforgettable experience. Follow the link to reserve your Smoky Mountain rafting adventure today!